- "Welcome to our Internet Explorer Tutorial. This tutorial is divided into two sections. 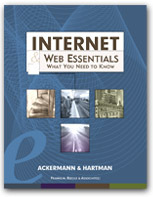 Section I contains all the Commands And Functions for Internet Explorer. Section II contains some special features in Internet Explorer. " - "From the basics of browsing the World Wide Web to the details of banking online, the Microsoft® Product Insider Internet Guide delivers the knowledge you need to venture onto the Internet, explore its vast offerings, and make it work for you. "